When most people think of arthritis, they associate the joint pain with ‘getting old.’ Many people would never expect that these conditions can affect people of all ages. Hadley and her family were no different. But, in June of 2016, at the age of two, Hadley was diagnosed with Juvenile Idiopathic Arthritis (JIA). Idiopathic refers to the disease’s unknown origins. As Hadley has grown older, the condition has progressed from one knee, to two, an ankle, and continues to arise in new joints. As you might imagine, JIA throws a loop in the natural cadence of childhood. Hadley must undergo treatments about every five to six months. This entails medical visits where doctors drain her affected joints. They follow this up with injections to stem the swelling. Hadley must undergo General Anasthesia each time. All of this is a lot to handle for any person, let alone a four-year old child. Hadley’s mother, Sara, is her biggest supporter through all of these tough times. She attests to the amazing team of doctors at the Children’s Hospital of Pittsburgh for both Hadley’s overall health and incredible spirit! Although her disease can cause extreme joint swelling, stiffness and pain, the preschooler does not let it dampen her spirits. 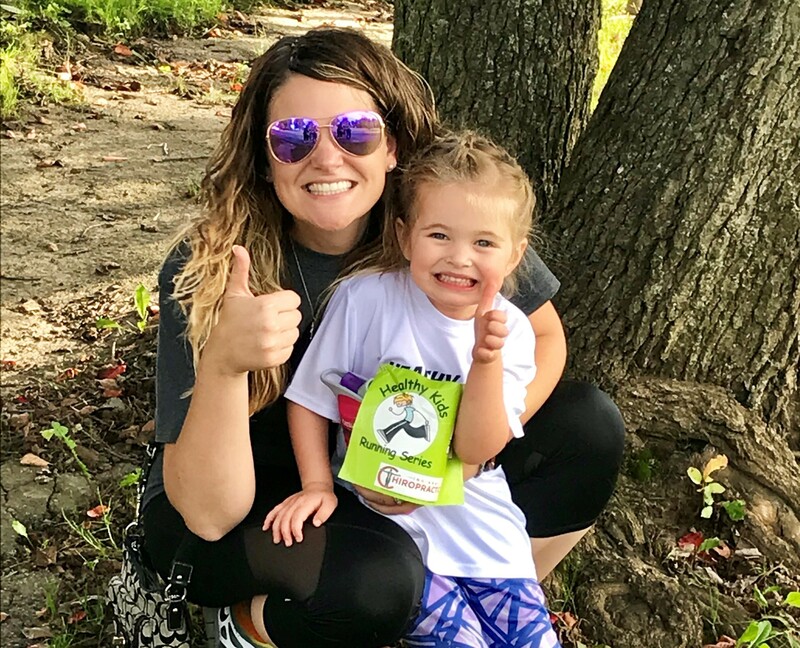 Meghan Foulk, the Coordinator of Healthy Kids Running Series in Indiana, Pennsylvania has witnessed Hadley’s inexorable strength first-hand! Megan and Sara were friends prior to Hadley’s participation in the Series. Sara found out about HKRS when Megan posted about it on Facebook. After talking to her, they decided that this was something that Hadley could try. Afterall, movement is good for Arthritis! In here first race, Hadley managed to sprint through the finish. She ran right into the arms of Meghan, and Meghan described her hug as one of the ‘absolute sweetest’ moments. 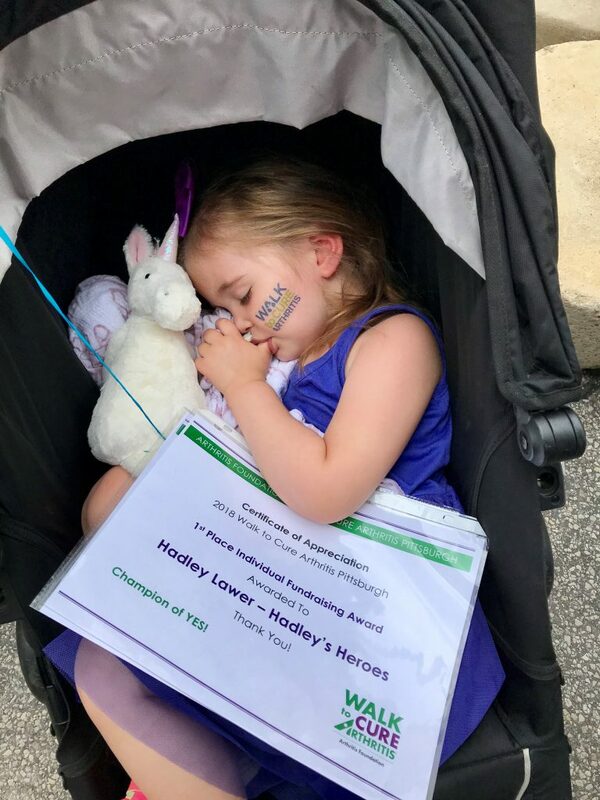 Afterwards, Hadley told her parents, ‘This is not about winning, it’s about finishing.’ How can a four-year-old struggling from juvenile arthritis find that type of perspective when it alludes so many people throughout their whole lives? Outside of HKRS, Hadley has been active with the Pittsburgh Arthritis Foundation. 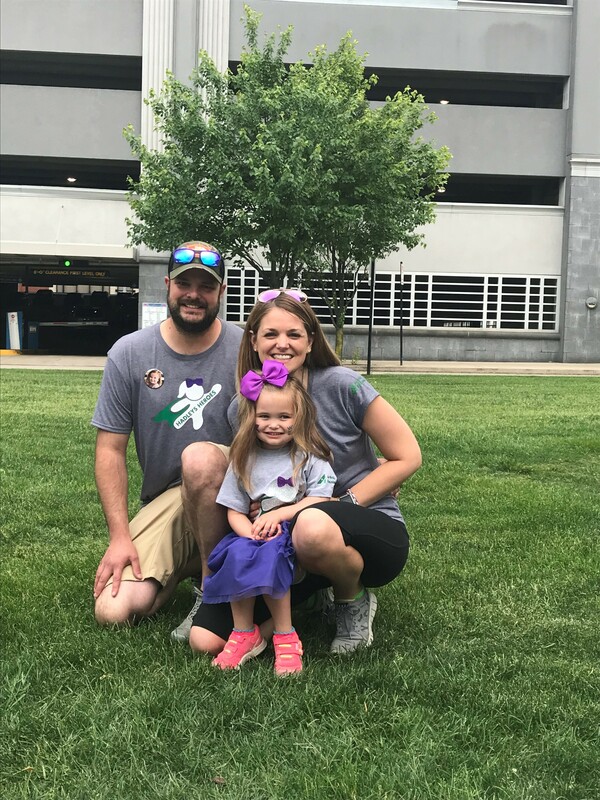 She was even selected as the Youth Honoree for next year’s Arthritis Walk for the Cure, Pittsburgh in June of 2019. This means that Hadley will have the opportunity to speak on her condition and her perseverance to many others affected by the disease! The reason why Hadley has received this privelege? She was the top fundraiser for the walk in 2018. She decided to seek donations from friends, family and others for her walk in lieu of birthday presents! Wow! She can’t wait to take on next year’s challenges as the Honoree. Sara continuously reminds Hadley there is more to life than the pain that she must endure. It seems like it has worked with the positive attitude and spirit that Hadley carries with her wherever she goes. Although activities may fair more difficult at times for Hadley, it does not stop her from enjoying all that life has to offer! Each week at HKRS, she improves, and does it with a smile on her face. She can be proud of what she is accomplishing and although she may not realize it, she has taught the people around her more in her 4 years than many teach in a lifetime! Thanks for inspiring us all, Hadley! !